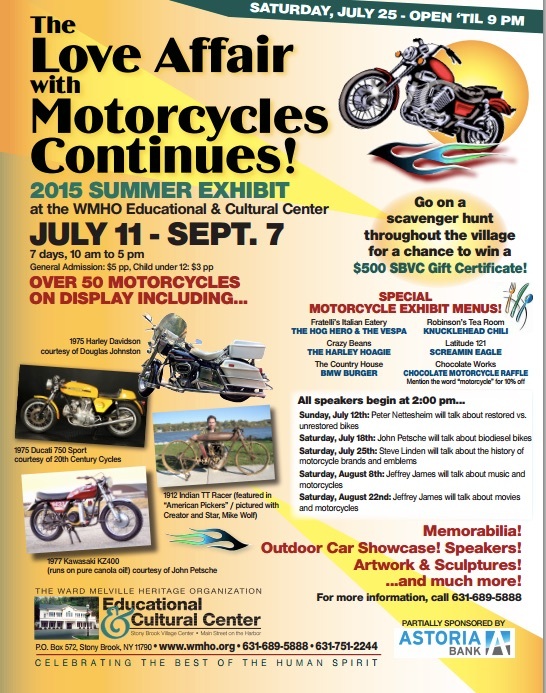 For the second summer in a row, locally there has been a small but lovely motorcycle exhibit at the Stony Brook Village – Ward Melville Heritage Organization Educational & Cultural Center. Running from July 11 through September 7th is: The Love Affair With Motorcycles Continues. My hope is that the show has been well attended by enthusiastic motorcyclists. It would be wonderful to continue this type of motorcycle-positive programming for our community. It does my heart good. I liked this exhibition last year and was the first to promote it among my friends. I’ll go back again. We can never get enough of sculpture with two wheels! I love going to vintage bike shows, so many of the old bikes are works of art. Thanks for sharing Fuzzy!